There are certain questions that we get asked each year by potato growers, novice and experienced growers..
Do I need to chit my spuds? Yes, it is ideal to chit your spuds to give them a head start. This normally takes 2–3 weeks. If the sprouts are white, they don’t have enough light; they should be a dark-purple colour. Chit on a windowsill or other lighted area but not in direct sunlight. How do I grow potatoes in pots? 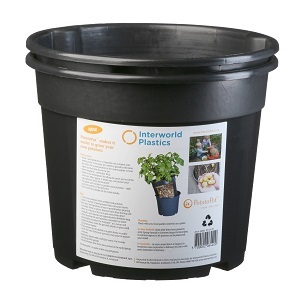 Easily done: Incorporate garden soil, compost and potato fertiliser in a pot. Fill the container to 2/3 full, place the spuds, then fill the remainder of the pot. Don’t fill quite to the top so you can create a water reservoir. Remember to feed regularly and water daily once growing. Once you have waited your number of days (depends on the variety you use), tip the pot over and viola, you have spuds. How do I grow potatoes in the garden? Dig a trench 40cm deep. 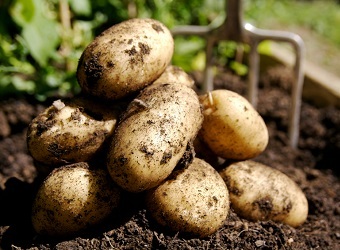 Add a handful of potato fertiliser per metre length of trench. Add 5cm of compost and place the spud. Backfill the trench with more compost mixed with garden soil. In the garden do I need to mound the soil? Yes, you do. This stops the new potatoes getting burnt from the sun and stops nasty pests from attacking. 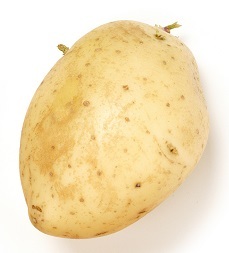 You can either mound potatoes at the time of planting by making a 30–40cm mound, or the traditional way is every time the potato shoots reach 15cm tall, pile more soil 10cm up the shoot. You then repeat this step until maturity. What is the best potato to plant? We all have our favourites, and we are having a debate as I write. It depends on what you like to use the potatoes for. Have a look at our potato board in store to help you choose, then ask our staff and see if they agree with your choice. A late frost caught me. How do I save my crop? There is not much you can do, but the problem is when the sun hits the leaves it burns them, which kills the plant. So before the sun comes out, try and save the leaves by covering them with newspaper. Once the frost on the leaves has melted remove the paper. What are these holes in my spuds? Once you have harvested you may notice little holes in your spuds. This is from wire worm (which can also affect carrots). Nothing much you can do for it this season, but you will need to stop it for next year. You need to plant the green crop mustard in late autumn and dig it into the soil after six weeks. Otherwise you can try potassium permanganate, which I have heard great things about, and this can be added now. What is the scab on my potato? The scab is generally caused by a lack of calcium in the soil. Incorporate gypsum at the time of planting to avoid this issue. This is a nasty insect that injects a toxin into your plant. Once injected your crop will start to die rapidly. There is no cure; prevention is the key. Incorporate Neem into the soil at planting time and then every six weeks. You can also use Success Ultra or Mavrik as a prevention spray. Harvest spuds before high summer to avoid issues. To avoid blight, buy certified seed spuds from garden centres and choose blight resistant varieties. Harvest before high summer as blight breeds in hot, humid climates. You have too much nitrogen in your soil and not enough potassium. Sheep pellets are great but can’t be the only source of nutrients with potatoes. 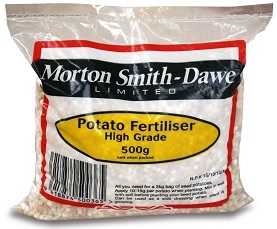 Potato fertiliser is high in potassium, which promotes root growth, and potatoes are a root crop. Why are my potatoes small? They are either not ready to harvest and you need to give them a little longer, or your soil may be too light. Potatoes prefer a heavy soil, so mixing the existing garden soil with compost makes a perfect soil medium. How long until I harvest? Each potato is different and it will generally tell you when on the bag of the one you purchased. If you are not sure, dig up one plant and look at the size to decide. As a rule, most varieties take 90–100 days. No, not all potatoes flower, well not that you will notice. Your crop is ready to harvest when at the maturity date or when the shoots wither and die. Can I plant potatoes from the supermarket? You can but you shouldn’t. You are more likely to get viruses in your plant. Also, the potatoes at a supermarket are often treated with chemicals. Need more in-depth info? Grab a copy of the Oderings Gardening Guide, “Growing Potatoes”, in store or online.